Trixie & Monkey - Flipping & Stripping - Australian Tour 2013! New York City's award-winning burlesque duo Trixie Little and the Evil Hate Monkey are heading to Perth Fringeworld, Adelaide Fringe and The Butterfly Club in Melbourne in February and March to present their eye-popping acrobatics and banana-flavored insanity! Trixie and Monkey present their greatest acts, cultivated during a decade on the road in America. For discerning audiences who like their entertainment both brilliant AND stupid, Flipping and Stripping will feature acrobatics, striptease, shenanigans, jaw-dropping burlesque and boylesque ... and a monkey in a tutu. 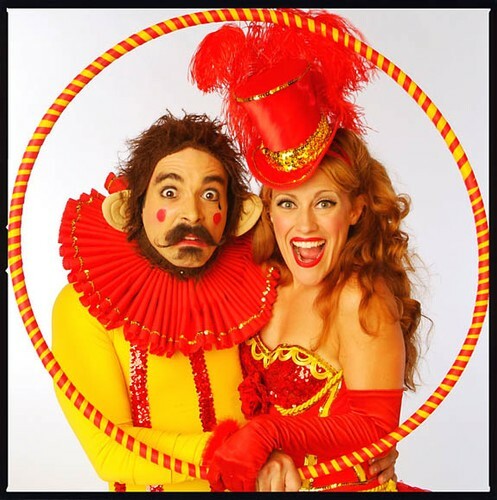 Mixing years of high level circus training, brilliant comedy and electric onstage chemistry, their original mix of circus and striptease has earned them titles such as Best Burlesque Duo 2006 and Monkey’s King of Boylesque 2010 title at the Burlesque Hall of Fame in Las Vegas. Performance highlights include: opening for John Waters, The Flaming Lips, Fringe Festivals (Philadelphia, DC and Brighton, England), an artist residency at the Off-Broadway theater Ars Nova, headlining burlesque festivals (Toronto, Colorado, Helsinki and Stockholm), Speigeltent shows (Norfolk & Norwich, Nooderzon Festivals), performing at four Virgin Mobile Music Festivals, appearance on “The Gong Show with Dave Attel” on Comedy Central and "Unleashed by Garo" on the Sundance Channel. They've also played in Australia in 2012 at Harvest Festival and Adelaide's Feast Festival. In New York City, the two are late-night fixtures everywhere from exclusive nightclub The Box to long-running burlesque shows like The Slipper Room, and nights at Coney Island and have been called "the only way to end the party" by the Village Voice.